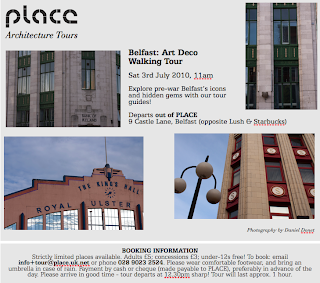 PLACE Blog: Saturday 3rd July, 11am - Belfast Art Deco tour! Explore pre-war Belfast’s icons and hidden gems with our tour guides! Strictly limited places available. To book: email info+tour@place.uk.net or phone 028 9023 2524. Please wear comfortable footwear, and bring an umbrella in case of rain. Payment by cash or cheque (made payable to PLACE), preferably in advance of the day. Please arrive in good time - tour departs at 11am sharp! Tour will last approx. 1 hour. Please note the earlier start time of 11am and the change of departure point: all tours will now depart out of PLACE, which is located at 9 Castle Lane (beside Cornmarket and opposite Lush & Starbucks - see a Google map) at 11am. And coming up on 24th July @ 11am, Belfast Churches - Architecture Walking Tour. More details soon!